Just one Mr. Robot aftershow episode wasn't enough for USA, so the cable network is going to make them a weekly—and digital—event for Season 2. USA has partnered with The Verge, Vox Media's technology-themed website, for a Mr. Robot digital aftershow, which will stream weekly on The Verge and USA's Mr. Robot site beginning on Wednesday, July 20, following the critically-acclaimed hacker drama's third episode. The aftershow—the full title is Mr. Robot Digital After Show Hosted By The Verge—will be produced by The Verge and Vox Entertainment, filmed at the company's New York studio and hosted by a trio of Verge staffers: editor in chief Nilay Patel, entertainment editor Emily Yoshida and reporter Russell Brandom, the site's cybersecurity and tech expert. 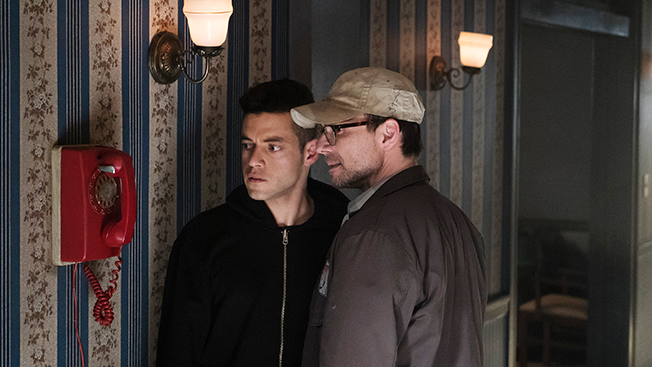 The hosts will analyze each episode, discuss the hacking and cybersecurity approaches utilized in that week's show, while exploring the larger context and ramifications of creator Sam Esmail's themes. "They'll talk about what you're seeing on the show from a fan perspective, but also from a technology perspective. What's realistic about these exploits, and is this something you should worry about in real life," said Chad Mumm, vp, Vox Entertainment. Mr. Robot cast and crew members will also appear on the aftershow. This is part of a larger partnership between The Verge and USA around Mr. Robot's second season, which is an extension of NBCUniversal's $200 million investment in Vox Media last August. The Verge had previously been featured in USA's one-hour special, Mr. Robot Decoded, which aired June 20. The site is contributing content to Mr. Robot's site, and also curating their own section of the Mr. Robot-inspired Disrupt Story installation at New York's Story concept store, while hosting discussions at the store. "There was never any dictate, like, 'you must work together.' The guiding principle was if there's something that is organic and can be mutually beneficial for our respective businesses, you now have a direct line to make that happen," said Alexandra Shapiro, evp, marketing and digital, entertainment networks for NBCUnversal Cable Entertainment. "So we plotted together very early on, both in terms of how could this be additive for us from an editorial perspective as well as potentially a business opportunity. They were both part of the equation, it wasn't just how can we create the opportunities that are just good for advertisers." Indeed, The Verge had been writing extensively about Mr. Robot's first season even before NBCUniversal's investment. "We got involved early on from just a pure fan perspective. The world of the show feels very similar to the world of The Verge, in terms of coverage and the way it looks at things," said Mumm, adding of the aftershow, "I could see us doing this without the partnership." Aftershows have become a regular staple of television, especially after the success of Talking Dead, AMC's Walking Dead companion, but USA says that Mr. Robot is worthy of further analysis each week. "Not every show deserves it, we know that. These things don't exist unless there's a hotbed of conversation and dialogue," said Shapiro. "We knew we had the IP [intellectual property] and fanbase to do that." A digital aftershow "felt appropriate" to Mr. Robot, and a great way to incorporate The Verge and USA, said Shapiro, but as the season approached, USA opted for a splashier linear afternoon for the season premiere, and decided to delay the Verge-hosted show a week. While The Verge's aftershow will be completely different from the program that will air on USA after the season premiere, that arrangement could change in future seasons. "A linear one-hour telecast is very labor intensive and also taxing on the cast, because we have to have all of them. There's more flexibility in the digital format," said Shapiro. "But that's not to say that in success, that if this digital aftershow takes off, that it couldn't migrate to linear." Look for more on USA's Season 2 strategy for Mr. Robot in the July 11, 2016 issue of Adweek magazine. Click here to subscribe.